Over 50 intermediate students and staff from Parkview PS and Coledale PS participated in the 360 Experience challenge in support of homeless youth in York Region and 360Kids initiative. 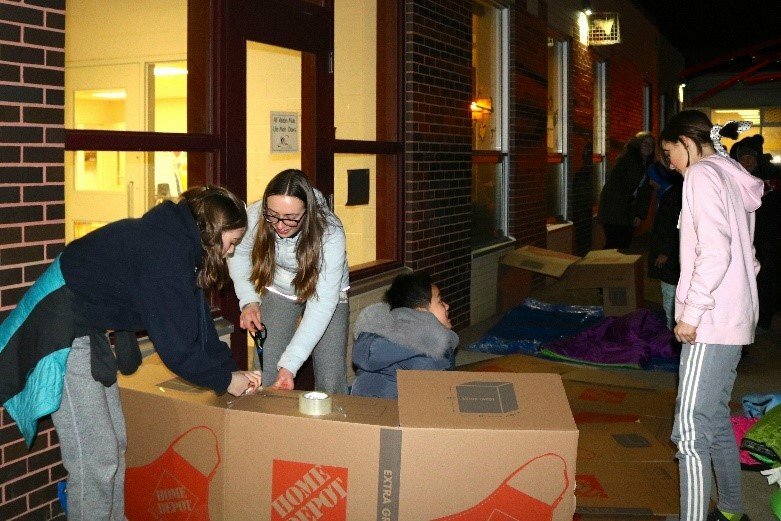 Participants spent a full night on the streets living the experiences of homeless youth to better understand the challenges they face on a daily basis and to raise awareness of youth homelessness in York Region. Students and staff also fundraised in support of 360Kids and raised nearly $4,000 to support homeless youth. “Collaborating with 360Kids allowed us to see a new perspective of youth homelessness. Learning about different socio-economic classes through engaging activities opened our eyes and broke stigmas about youth homelessness,” said Kimiya, a grade 8 student from Parkview PS. 360Kids is a non-profit organization supporting over 3,400 youth in York Region with a mission to help youth overcome crisis and transition to a state of safety and stability and a vision that every kid has access to a safe home. Photo: Local students fundraised in support of 360Kids and raised nearly $4,000 to support homeless youth.